Want to know how to steam blue crabs? 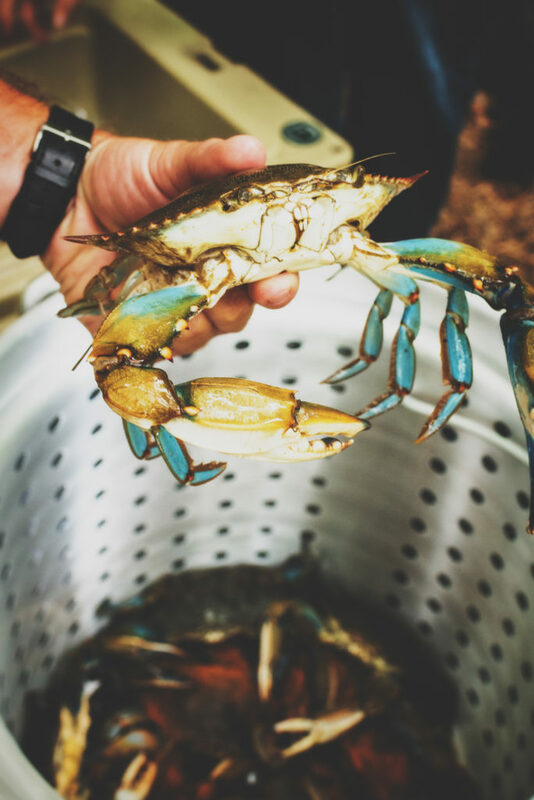 Here is it – from sizing and ordering to picking and a recipe on how to steam the perfect Maryland blue crab. Have you ever cooked fresh crabs? I’m talking right from the trap, still walking around blue crabs – which as a gal from the North East, are the only kind. Enjoying steamed crabs is an experience of primal delicious flavors that everyone should sample at least once. There’s something communal about spreading newspaper down and pouring out a half bushel of piping hot steamed crabs onto the table top and letting everyone go to town, with more time spent talking and enjoying company than actually eating. 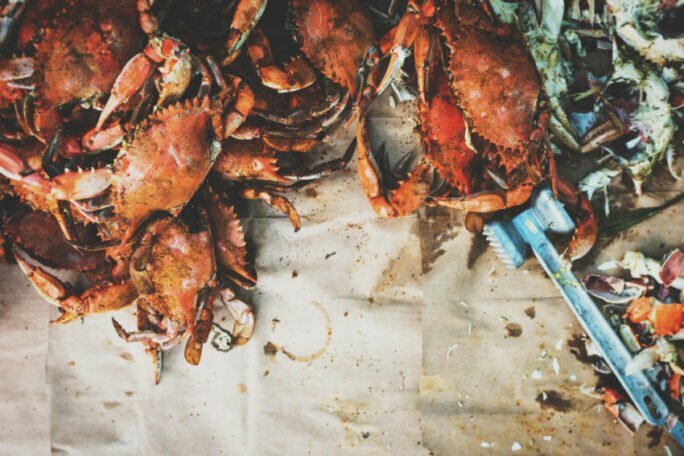 Lucky for you, I made a guide on how to steam fresh blue crabs so you too can enjoy all the fun of an old-fashioned crab picking. And also, enjoying all of your hard earned work like the perfect crab meat for crab cakes and pretty creamy crab bisque, and even omelets, but I am not biased at all. But, if you aren’t near the Chesapeake and don’t have a good honest blue crab shack nearby, can you re-create the experience or is it lost to those within driving distance of the Bay? Crab boils are common in the south, big vats of seasoned water with crabs, crawdads, corn, and potatoes and up in New England, they like to host their clam bakes out on the beach in pits dug into the sand. No matter where you travel, coastal seafood is all sorts of delicious, but I want to share a little flavor of my home with you. The Chesapeake region steam fresh blue crabs is a flavor unique to the Maryland coastal area, crabs coated with a hefty portion of Old Bay, and cooked to perfection over a beer and water mix. What is a Blue Crab? For those who are thinking of crabs, and the long buttery king or snow crab legs you can pick up at nearly any fish counter, this isn’t that either. For startes, yeah, they are blue. When they are right out of the ocean. But they do turn a bright red when cooked. 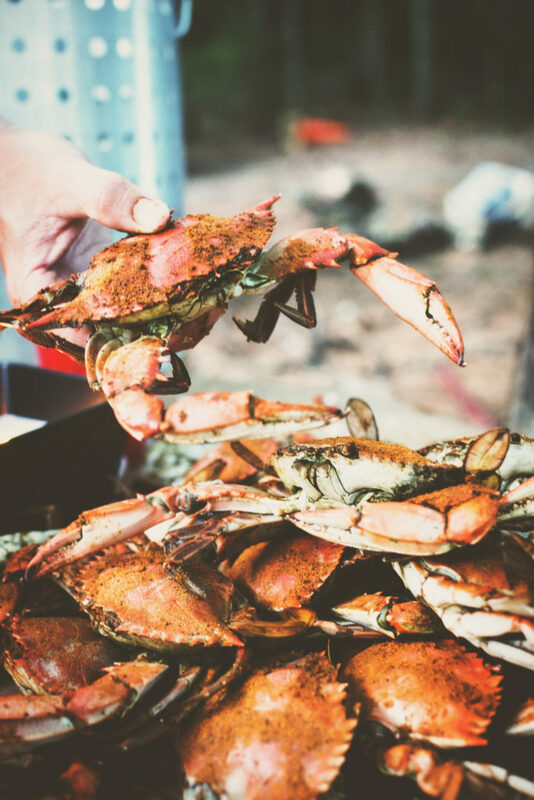 Blue crabs are the classic small tough gunned little crabs that are just bigger than the size of your hand and require far more effort to pick all of the meat-free correctly then their lanky crustation cousins, making for the most tender and flavorful crab meat you can get. Crab picking is not for the feint of heart, as the actual tearing open of the crab shell exposes just about everything. But, through the sting of lemon on freshly cut fingers and clumps of Old Bay caught under the nails, there is something utterly delicious about the simplicity of a steamed crab and an experience every seafood lover should enjoy at least once. Now, on to enjoying fresh steamed crabs, right from the trap. The best way to learn something is first hand from an expert. First, you have to find a vendor shipping in real deal blue crabs. Give a call to your local fishmonger and see what they have in stock. Which is going to lead to some questions, so read this over quickly before actually dialing that number. We only use #1 or #2 male crabs for our boils as they are grown into their shell and filled with meat. Crabs can be broken down into sizes too, ranging from 5 to 7 inches or so. When on the phone, make sure not to ask just for the number, but the actual size of the crabs to be sure of what to expect depending on the region you are in. Depending on how many people you have coming over to help you pick is going to drastically effect just how many crabs you want. A ‘bushel’ usually holds between 4 to 7 dozen crabs depending on the size you order. For a small gathering, ask about a half bushel or ordering crabs by the dozen. For a bigger party (or, if you really just want kicking leftovers) go in for the full bushel. Friends will never complain leaving with a bag of a few extra crabs. Pro Tip: When you pick the crabs up, make sure that they are alive and kicking. The fresher they are, the better they are. Remove any dead crabs from the batch before steaming. What tools do you need to Steam Blue Crabs? Here is a list of things you should stock up on if you are going to steam fresh blue crabs. Check out the affiliate links below to get yourself set up. A boat load of paper towels. A cooler to contain the live crabs and a steam pot. A few wooden mallets or blunt objects to help crack the hard claws and a thin poker to pull out and hard to reach meat or to just torment one another with as we rarely use them. A long sturdy table and some old newspaper to cover it goes a long way too, but it’s really not required. Pro tip: A steamed blue crab is nothing without Old Bay. It’s a magical blend of spices that is the signature Chesapeake flavor of seafood. Go hunt it out in your local market or smuggle some back from the McCormick store in Baltimore Harbor next time you stop through on a layover. Google, or a family friend who has picked crabs before to show you exactly how it’s done. Picking crabs can be tough, but it’s really not a hard thing to do, once you have learned a few tricks. Learning from an old pro is really the best way to enjoy your first fresh crab. A few rolls of paper towels at either end of the table and a cooler for of ice cold beers will pretty much guarantee you as the best host ever if you really want to go the extra mile. Step 1: Remove the claws. Dislocate the large front claws from the main body by moving them back towards the top shell of the crab, away from the belly. They will pop out without much resistance. Save those for later; they are the bacon of the seafood world. Step 2: Peel back the apron. Flip the crab over and pull the triangular part in the center called the apron back with your fingers or a butter knife. Pop that off and toss it into what will soon be a pile of shells to clean up later. Step 3: Pry the top of the shell off with your fingers exposing the insides. Start gently poking fun at anyone who is new to this and has just become freaked out, or wait a moment and tell them to scrape out the lungs and mustard before the jesting begins. But, yes, now scrape out the gills and the thick yellow substance called mustard. Step 4: Once cleaned, gently hold the crab with both hands and crack in half, bending the crab in towards itself gently. You will feel it snap. Now you can get to picking. I like to pull the remaining legs gently out to see if I can get any large chunks of meat to slide out before just going into the main body with my fingers. Step 5: For the large claws you left aside earlier – these are the best part. I, personally, snap the flexible claw back to see if I can get lucky with any meat sliding out, then snap the leg at the joint before cracking the large claw open if all else fails. With a blunt object, gently break the shell of the claw (a hard whack and you will just get tiny shards of shell everywhere). Peel off the shell, exposing the large chunk of claw meat. Enjoy. New to crab picking or an old pro? Let me know! If you are adventuring through my region and looking for a suggestion on where to get the freshest crabs and best experience, shoot me a message and I will happily help you out. 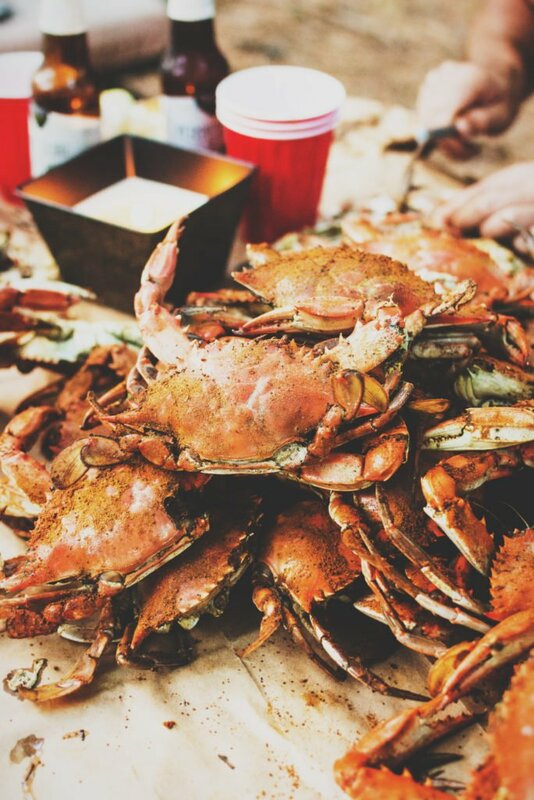 Crab picking is a Maryland region classic pastime and I hope you enjoy it as much as we do! I can’t get enough of these crabs! Or any seafood for that matter. If you’re looking for more crustacean inspiration, this is the place to be. Try these out! 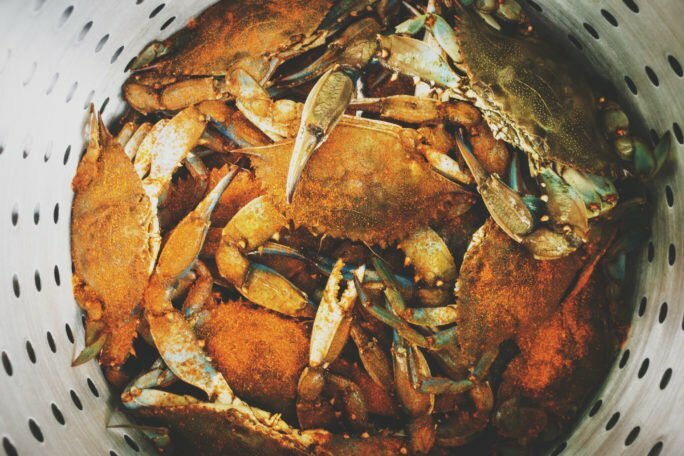 If you’ve tried my How to Steam Fresh Blue Crabs Recipe or any other recipe on GirlCarnivore.com please don’t forget to rate the recipe and let me know where you found it in the comments below. I get inspired by your feedback and comments! You can also FOLLOW ME on Instagram @girlcarnivore as well as on Twitter and Facebook. 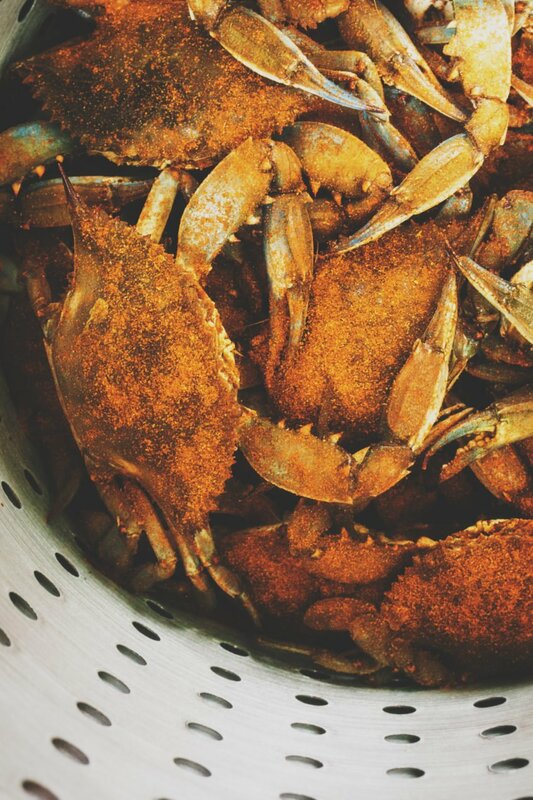 Grab a bushel of crabs and a case of beer. It’s time to enjoy the bounty of the Chesapeake! Mix enough water and beer in the pot of the steamer to get a rolling boil as per the manufacturers directions for your steamer. Arrange the crabs in a single layer in the steamer pot and sprinkle with a thick coating of Old Bay. Arrange another layer over top and repeat. Place the steam pot over the boiling water and cover the lid tightly. You will be working in batches, so don’t try to fit them all in. Steam the crabs until cooked through, checking after 15 to 20 minutes to see how things are going. Depending on how big your pot is, how many crabs you packed in there will determine how long the steaming takes. The crabs will have turned a beautiful bright red color when done. With the steamer pot carefully removed from the boiling water, pour out your first batch onto the table and begin the second batch for steaming. Thank you for sharing at Delicious Dishes Recipe Party!! Great info on steaming crabs! I love this recipe!